This is week 1 of our second round of classes with Scraps at K9 Campus with Linda as a teacher. This 8-week class we are euphamistically calling remedial intermediate agility. It’s super cold Friday night in January with a lot of snow outside. It is warm in the k9 Campus but it is 20 after 8 and we haven’t started class yet. With only 3 dogs in class we still should get plenty of good practice in. First run is a simple loop to get going with an emphasis on ” go tunnel” with a tight walk-jump-weave combo to finish. We did 2 runs and he had some hesitancy with going into the tunnels but the 3-part combo at then end was executed really well. Scraps’ weaves were really fast considering he probably hasn’t weaved in weeks. Second set of runs we are practicing “out” versus a “go” to get them out and over a jump. Scraps is doing it well and has excellent focus and speed tonight. It is some good practice ofr him. We ended with some teeter practice, not going over it but just having fun banging on it. Week 2 of class found us once again in a very cold and snowy environment but this week was different. Maybe Kathy’s back was weak from all the shoveling because she tweaked it earlier in the day. This meant I was to run with Scraps instead of Kathy. With the messy winter mix outside I was running in my hiking boots but that didn’t stop Scraps and I from running really fast through the practice drills Linda set up for us. It was pretty exhilarating running at such fast speeds with Scraps yet learning the techniques on how to run a course in such a controlled manner. Week 3 of this class is starting with learning to jump varied jumps with respect to distance between each and jumps being at angles. 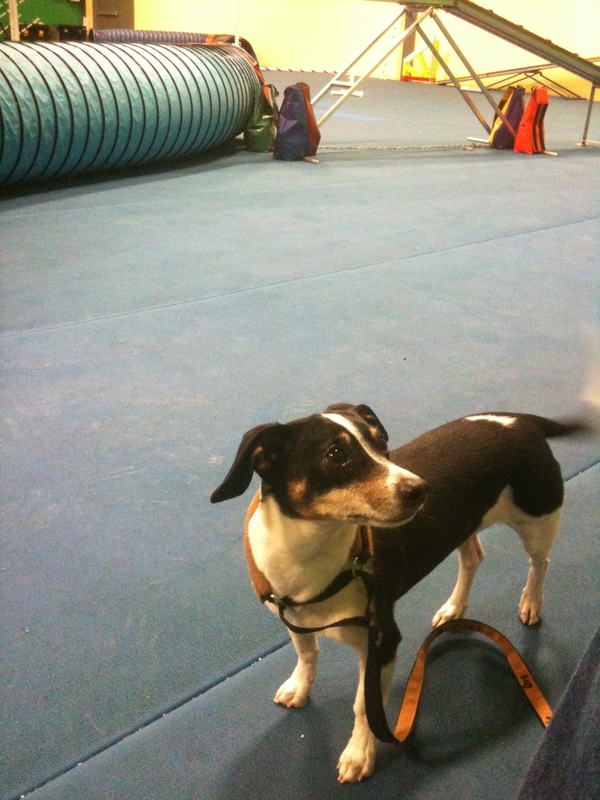 Additionally, we are learning Linda’s front cross technique where you have the dog go over a jump and the front cross turns him 180 degrees by a virtual grab of the collar while you pivot away fro the jump indicating to the dog that we are turning. On our first run Scraps jumped with a nice rhythmic bounce in a good way as he is a good jumper. Kathy didn’t really catch up enough with Scrpas exiting the tunnel to try to even attempt the front- cross. On the second run, Kathy got the front cross but still needs to run faster and slower indicating to Scraps her intentions through this acceleration / deceleration technique. It was another cold clear night outside but the K9 campus was warm inside which helped Scraps’ warm-up nicely before the runs. First run includes a series of 6 jumps in a row a varied distances. Linda wants to mix up the jump distances and heights so the dogs can judge how high and far they have to jump, this way their jumps are efficient and they don’t jump higher and harder than they need to. At the beginning of a a run never start them to close to the jump where they don’t get a few comfortable strides before they jump. Some people learn their dog’s optimum distance before a jump and count off the steps like a field goal kicker and place their dog at the proper starting distance. The first run with Scraps was under control and virtually flawless; speedy yet relaxed. On the way in reverse it was also well done. Scraps missed a tunnel entrance and also hit a bar on the series of jumps to close the run. Now we are running it with the jumps at both 8″ and 12″ heights to make it a bit more challenging in its variety. Scraps did really well on this run and adjusted like a thinking mammal between the varied jump heights. The third run we are using the tunnel to work on the “go” command to get them to go do the tunnel. She is encouraging us to say “go,” “go,” “go” to send the dog over two jumps and to the tunnel. Scraps would “go” over jumps but would turn around to look for confirmation and abort a solid entry into the tunnel. He never really practiced “go” recently, so I guess we couldn’t expect too much. We worked on more “go” with jumps and a toy as a lure to get them to go. It worked really well for Scraps as he was focused on his toy. The exciting conclusion to week 4 is that Linda gave me permission to have Rags join the class. I hope I don’t get kicked out during the first week but it is exciting to have Linda teach the two of us. Stay tuned!